Annie Duke has been a poker professional since the 1990’s and makes regular appearances at the World Series of Poker, where she won an Omaha Hi/Low bracelet in 2004. Off the table she is also known for her different business ventures and TV appearances, notably when she finished 2nd to Joan Rivers in the 2009 season of The Apprentice. 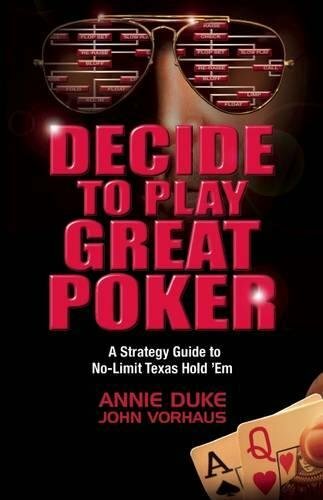 In "Decide to Play Great Poker: A Strategy Guide to No-Limit Texas Hold 'Em", she teams up with established poker author, John Vorhaus and explains her insights into the game. This book is split into three sections - Preflop, Playing Flops and "The Rest of It". In the first part Duke explains the subject of position and raises, along with not relying completely on the strength of your hand. The Post flop section then tackles playing different types of boards both in and out of position. The final section tends to focus on bluffing tendencies and river action, with Turn play and many other subjects you could include here simply disregarded. "Decide to Play Great Poker" feels like an over-complicated book with not much depth. It starts by declaring there will be no hand chart, then goes about giving you black and white answers on how to approach different situations. The advice it offers is, at best basic and in some spots questionable, although it does offer new players a good general guide to playing tight aggressive poker. However, for the information contained, it is a hard read and in order to get anything meaningful, you will have to trawl through pages and pages of instructional text. Even the hand examples, which do incorporate graphics, only use the bare minimum. Overall if you have just learnt to play No Limit Texas Hold'em, there will be parts of "Decide to Play Great Poker" which you will find useful. It does lay out a solid Tight Aggressive style of play with deep stacks, although there is no clear difference made between tournament and cash game play. The advice is easily followed and will get you results against weak opponents, however it suffers in execution. There are many more poker books available which do exactly the same, while being far more enjoyable reads.